Is Mount Vesuvius the most dangerous? 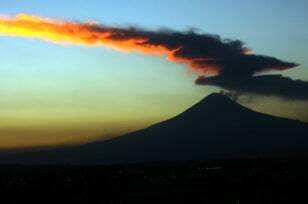 Will spirits warn when Merapi is ready to go? Will disaster of Nevada del Ruiz be repeated? 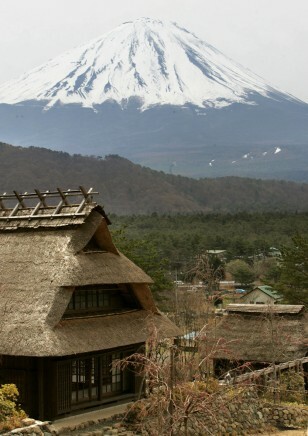 Is majestic Mount Fuji overdue for an eruption? After 9,000 years of dormancy, the Chaiten volcano in southern Chile awoke in 2008 and began a series of eruptions that spewed ash miles into the sky, as shown in this image. 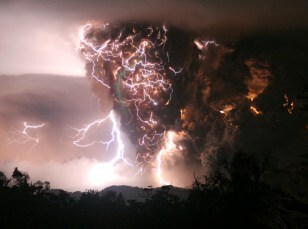 The volcano's namesake town of 4,500, just 6 miles from the spewing crater, was devastated by falling ash and floods. The eruption claimed at least one life and serves as a stark reminder that slumbering volcanoes pose grave dangers. Click on the "Next" label to learn about seven more dangerous volcanoes around the world. Italy's Mount Vesuvius is most famous for the A.D. 79 eruption that buried the cities of Pompeii and Herculaneum. Despite the dark history, millions of people today live near the volcano. The thriving mass of humanity in such close proximity to the volcano makes Vesuvius a serious contender for the world's most dangerous volcano. 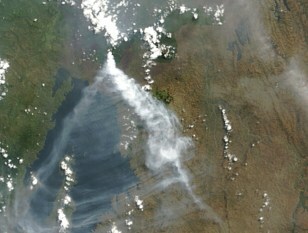 Scientists fear that a catastrophic eruption could hurl scalding gas-rich magma, water vapor and debris at the masses with insufficient warning time for an evacuation. Mexico City, a metropolis of 18 million people, sits 40 miles to the east of Popocatepetl, the second tallest volcano in North America. Puebla, a town of 2 million, lies 30 miles to the west. A major eruption, scientists say, could choke the skies with ash and send massive mudslides into the crowded valleys below. The result could prove catastrophic. The volcano has been relatively quiet since a bout of activity between 1920 and 1922, though it rumbled back to life in 2000, as shown in this image, prompting evacuation orders and worries that "Popo" is ready to blow. Merapi in Indonesia is one of the world's most active volcanoes, regularly spewing hot gas and ash miles into the sky, and sending mud and fragmented rocks down the sides. In 1994, 60 people were killed by a searing gas cloud, and about 1,300 people died when it erupted in 1930. 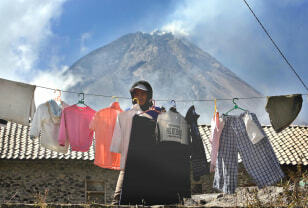 During a bout of eruptions in 2006, many villagers, including the woman in this picture, refused orders to evacuate. They believe the spirits will warn when a catastrophic eruption is imminent. Lava flows, while hot, are rarely deadly: They usually ooze slow enough that people can easily outrun them. That's not the case with the lava that flows from Nyirangongo in Africa's Democratic Republic of Congo. It has very low levels of silica, the mineral that thickens and slows lavas. In 2002, Nyirangongo's lava suddenly gushed at speeds up to 60 mph into the town of Goma, which is home to half a million people. Scientists fear that lava pooling in the crater could suddenly drain again and cause even more devastation. 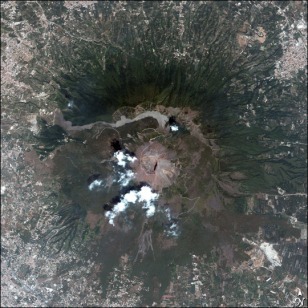 After nearly a year of minor earthquakes and eruptions, Colombia's Nevada del Ruiz volcano exploded on Nov. 13, 1985. Pyroclastic flows melted the summit's snowcap. Mudflows, called lahars, raced down the mountainside. One mudflow wiped out the village of Chinchina and killed 1,927 people, according to reports. 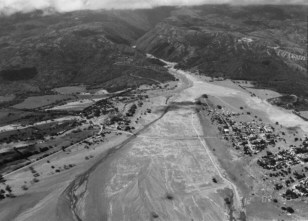 A second followed the same path as earlier lahars and swept away the town of Armero, shown in this image. An estimated 23,000 people died, making it Colombia's worst natural disaster. Scientists said an early warning system could have averted the loss of life. Now that one is in place, will it work when the volcano wakes again? The islands of Japan harbor more than 100 volcanoes, and a handful or so erupt every year. The majestic Mount Fuji, shown here, has not erupted since 1707, but a swarm of low-frequency earthquakes in 2000 and 2001 raised the specter that the mountain was awakening from its 300-year slumber. Though Fuji has since quieted down, the risk to Tokyo, a city of 30 million people just 70 miles to the east, is very real, scientists say. A 2004 government study put the price tag of a worst-case eruption at more than $20 billion. 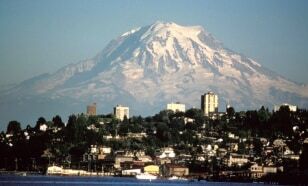 Washington's 14,410-foot-tall Mount Rainier, shown in this image, is a big attraction for many people in the Pacific Northwest. It is also a big threat, according to scientists. An estimated 3 million people live in its shadow — at least 100,000 on top of old mudflows from previous eruptions. The flows, known as lahars, are the greatest risk. Though commonly associated with major eruptions that strike with ample warning, an earthquake or small burp of rock, ash and gas could also trigger a lahar, giving residents in the path only 10 to 15 minutes to escape.